Ankur Jain is a philanthropist and entrepreneur. Inc.com recently named him the "best connected 21-year-old in the world" and by the end of this year, Jain will be the youngest person ever to go to space. Getting down to business, Jain is known for founding Kairos Society, a network of college entrepreneurs dedicated to changing the world through business. 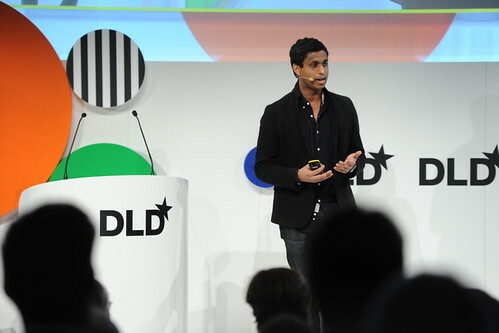 Other than socializing, Jain is here at DLD14 today to launch Humin. He opens his presentation by noting that he may slowly be getting older. "This weekend has been the first time I've found myself saying, 'do you remember when', like, 'do you remember when you had to call people at home before cell phones?'" Around a year ago, Jain was sitting at dinner with a good friend of his. Both were on their phone. Bother were communicating via their phones – even with each other – but there was no actual conversation. "Somewhere along the lines, technology got in the way of real connections. So I asked myself whether we could actually build a phone that fulfills its original promise of actually connecting you to people?" His answer to that question is yes. The shape of his response is Humin, which Jain introduces as "your new phone" in a short demo. Unlike a traditional phone, which simply lists contacts alphabetically, with Humin social interactions are taken into account. When you meet someone, the phone registers where and when you met, where that person works and flags up common friends. Frequency of interaction is taken into account and the search function looks not only for names, but also for other bits of information – like the location of the first meeting. The project is still in very early stages. Jain invites all DLD attendees to join before leaving the stage.